Home Latest Exclusive: Danny Denzongpa Is Playing Ghulam Ghus Khan In Manikarnika! Kangana Ranaut’s upcoming movie Manikarnika: The Queen of Jhansi is creating headline since the day one. The fiery and angry posters of Kangana in Manikarnika making her fans go gaga to watch her upcoming film. The film is nearing to its release and the makers have started revealing the first looks of the characters. However the focus will be on Kangana Ranaut’s character Rani Laxmibai in Manikarnika, but other character is also as important as Kangana’s. 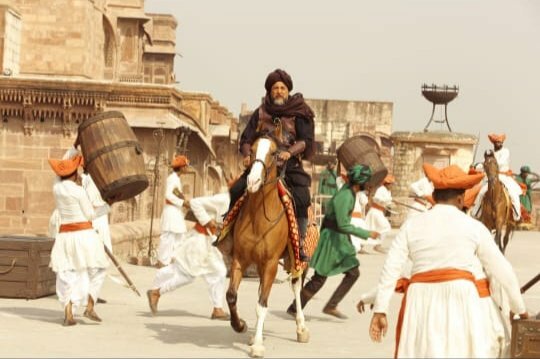 After revealing the first look of Kangana Ranaut and Ankita Lokhande, the makers of Manikarnika – The Queen of Jhansi have now revealed the first look of Danny Denzongpa. Danny Denzongpa is playing the role of Ghulam Ghus Khan in this film. Ghulam Ghus Khan was an Indian freedom fighter belonging to the famous Khatar Khan family of Rawalpindi and was very close to Laxmibai, He was one of the commanders of the Laxmibai and was killed on June 4, 1858. In the poster Danny Denzongpa dressed up in a black pathani kurta salwar paired up with a turban and a leather vest. Danny can be seen mounted on a horse amid chaos in the city. After seeing Daany’s first look in the poster it seems that his role is quite intense in this movie. The film Manikarnika is based on the real life story of the warrior queen Rani Laxmibai. Rani Laxmibai was the first woman in the Indian history to fight against the British and started the first war for Independence. In Manikarnika the lead role is played by the gorgeous and bold actor Kangana Ranaut. The teaser of Manikarnika is already out and now the fans are waiting for the trailer of the film which is going to be out on December 18. The movie Manikarnika: The Queen of Jhansi will hit the silver screen on 25th January 2019. Next articleExclusive: Riteish Deshmukh To Get Hit In Bollywood Follows Shah Rukh Khan’s Acting Mantra.